“This is a new and innovative project that we believe will, over time, help us to reduce our carbon footprint further as well as making financial savings." “The amount of pre-planning and consultation about the general impact of the installation was magnificent." “Roof spaces like the size and orientation of Camlab can really reap the benefits from a system like this." “The installation delivers real dividends. It fits with the college’s sustainability agenda and saves money on our energy bills, which can be diverted into other areas." "The system is exactly what we needed as it gives us a rare opportunity to save on one of our major costs." “As a company we have been keen to adopt innovative technology over the years." 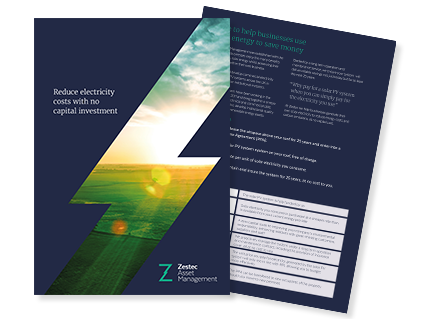 Zestec’s experienced team has significant experience in developing and managing renewable energy systems for a wide and diverse range of commercial clients across most UK business sectors. Take a look at just a few of the organisations our team has helped and who have been enjoying reductions in their energy costs and improved sustainability credentials through our solar power purchase scheme. When you are ready to find out more, download our latest brochure or get in touch. As part of a companywide environmental project Stagecoach commissioned the installation of solar PV systems on Stagecoach UK bus depots under a fully funded power purchase scheme. The Apple Growers Association (AGA) in Tunbridge Wells has sown the seeds of future business growth with nearly 800 solar PV panels on its roof. Camlab, headquartered in Cambridge, has been supplying water testing and laboratory equipment globally for nearly 50 years. A Sussex bowls club is rolling back its electricity costs after going green with 400 solar photovoltaic (PV) panels on its roof. The Hampshire Golf club is set in 240 acres of countryside in the Test Valley, near Andover. Faced with increasing electricity costs, the club decided to install a 30kWp solar PV system across the driving range shelter and greenkeeper’s workshop under a fully funded power purchase scheme. The cutting-edge solar power system was fitted free of charge on the roof of the Hendy Group’s Van and Truck Centre in Chandler’s Ford, near Southampton. Students at North Hertfordshire College (NHC) only have to look up to learn about the power of renewables after nearly 100 solar photovoltaic (PV) panels were fitted on their roof. Based in Kent, Mansfields is one of the largest fruit growing, storage and packing operations in the UK. They pick, pack and store more than 25,000 assorted tonnes of their own apples, pears, strawberries, plums, cherries and apricots along with large volumes of third party fruit.